A short video to help you learn more about shared solar programs. Shard solar allows anyone with an electric bill to buy a portion of their energy from a larger group of solar panels—panels that don’t even have to be nearby! A short video documentary about the Oswegatchie Hills and Niantic River estuary and the ongoing quest to save them. You can join our cause by watching today and signing our petition! 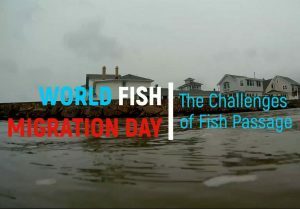 Enjoy this fun video highlighting the trials and tribulations of fish passage. Will the fish make it upstream? Watch their journey to find out! Senator Blumenthal announces pending legislation to permanently protect and preserve Plum Island, New York. Thanks to the removal of two dams in Southington and Meriden in summer 2016, migratory fish like American shad and river herring can now swim into the upper reaches of the Quinnipiac River for the first time in more than a century. This video shows the August 2016 removal of Carpenters Dam from the Quinnipiac River in Meriden, Connecticut. For the first time in over 350 years, Whitford Brook flows free! Save the Sound, supported generously by the U.S. Fish and Wildlife Service, Patagonia, the Long Island Sound Futures Fund, a grant program of National Fish and Wildlife Foundation, U.S. Environmental Protection Agency, and the Long Island Sound Study, championed the effort to remove Hyde Pond dam, in Mystic, CT. This video shows the August 2016 removal of Clark Brothers Dam from the Quinnipiac River in Southington, Connecticut, which opened 16 miles of blocked river for the first time in 150 years. These dam removals were supported by U.S. Fish and Wildlife Service Natural Resource Damage Assessment and Restoration Program. The Long Island Sound Pledge is designed so each of one of us can help improve our beloved body of water by doing just a little something—every drop raises the sea! And it’s as easy as 1, 2, 3.